A long-standing client faced marketing challenges with a medical device commonly used in hospitals’ intensive care units (ICUs). A competitor dominates the market and is continually improving the design of their product. Our client’s medical device is the high-cost entrant in the market and lacks any significant technological advantages compared to the market leader. Our client decided to address this situation by developing a next generation product. The product would be designed as a low-cost entrant with technological advantages. However, committing to being a lower-cost alternative left our client with the challenge of selecting which innovations to include in its new product. They had identified three broad areas where they believed the market would value innovation in terms of performance, safety, and ease-of-use. The challenge was to determine which specific attributes among 15 alternatives would best drive market share growth. Instead of relying on feedback from its sales force, discussions with the few members of an internal advisory board, or a few on-site visits, our client decided to conduct a rigorously structured market research study. Like the next-generation product, however, our client wanted to conduct the study cost effectively. The study’s results would allow our client to prioritize its redesign budget and develop marketing strategies and tactics that would most likely resonate with the ICU’s value-analysis committee. To best meet the study’s objectives, MedSpan designed a 25-minute online survey with a Maximum Difference (MaxDiff) scaling exercise. The MaxDiff exercise consisted of a series of 15 questions with a similar structure, as illustrated below. For each question, MedSpan listed five of the 15 technological innovations under consideration. Among the five alternative features, the respondent would select the feature they found most compelling and which would least encourage them to switch brands. Using our RapidAccess® database, MedSpan quickly recruited and gathered feedback from 75 ICU nurses located across the U.S. We ensured that the nurses represented a mix of hospitals based on type (community hospitals vs. academic medical centers), geographic location, number of staffed beds, number of ICU beds, and the brand of the device under consideration being used. We discovered that nurses would be most likely to switch if a product made their jobs easier and more pleasant. Specifically, if a new product made delivering medications and collecting samples easier, or if it limited odor emanating from the device, then nurses would likely switch from their current device to the new product. Our client’s main competitor is the market leader on the “ease” attributes but not the “pleasantness” attributes. We recommended that our client focus its redesign budget and marketing on the “pleasantness” attributes, an uncaptured part of the market that would enable our client to drive significant additional market share. Together with our client, we learned that user preferences may not always be apparent to device manufacturers. We identified what differentiates competing products from one another and which attributes are perceived to be advantages. We also learned that non-performance related attributes can be strong drivers of product switching. 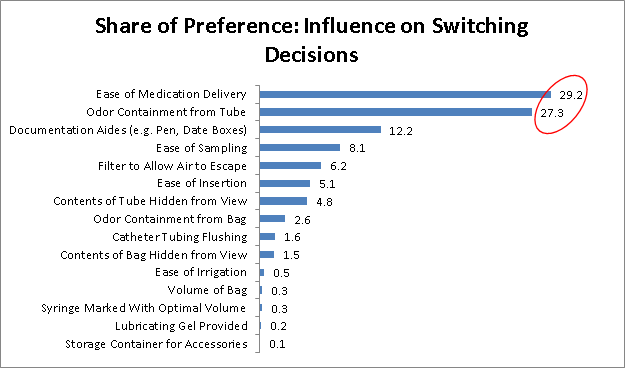 MedSpan was able to uncover key insights into product preference by refining a set of product attributes, testing this list with key decision makers, and quantifying the impact each attribute will have on product switching. Based on the study’s results, our client is now armed with specific “pleasantness” and “ease of use” improvements they can apply to existing product lines or incorporate into future offerings and marketing messages. These improvements will help drive an overall product strategy aimed at maximizing product switching, and ultimately, commercial success. MedSpan is a market access research and consulting firm providing companies actionable insights from payers, hospitals and alternate sites of care. MedSpan frequently conducts quantitative assessments to prioritize product attributes and clinical trial endpoints. Our access to key decision makers can deliver market insights that drive critical business decisions. RapidAccess® is a proprietary database developed by MedSpan which includes over 90,000 critical stakeholders and key decision makers from managed care, hospitals and alternate sites. With RapidAccess®, MedSpan delivers the right respondents quickly to ensure that your project is accurate, actionable and achieves the results you need. Entry filed under: Comparative Effectiveness Data, Healthcare innovation, Medical Device, Willingness to convert. Tags: device manufacturers, medical device design, medical devices. ACA to Greatly Benefit those with Pre-existing Conditions	Will Health Insurance Exchanges Make a Difference?